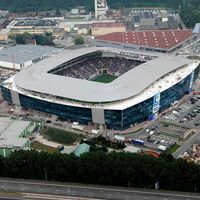 When KAA Gent met VfB Stuttgart in mid-July during the grand opening of Ghelamco Arena, very unusual precautions were taken to ensure fire safety – firemen had to install their own fire hoses to be prepared for a threat. Since then a lot has improved, according to the club, but still the stadium didn't receive a full-time safety certificate and requires inspection before every game. Dirk Piens, KAA director, hopes to see the very last inspection this weekend. According to him the stadium should be fully operational in all aspects before the KRC Genk tie on October 6.